Moss Lower Lock No 50 is a minor waterways place minor waterways place place on the waterways major waterways place village town city on the Rochdale Canal between Ducie Street Junction (Junction of Rochdale and Ashton Canals) (11 miles and 5¼ furlongs and 33 locks to the southwest) and Littleborough (3 miles and 4½ furlongs and 1 lock to the northeast). 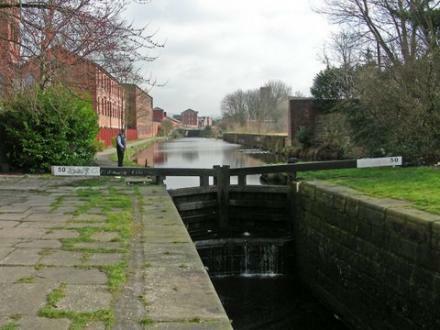 The nearest place in the direction of Ducie Street Junction is Oldham Road Bridge No 60; a few yards away. The nearest place in the direction of Littleborough is Moss Upper Lock Winding Hole; ¾ furlongs away. 83 Broad Lane, Rochdale, OL16 4PR — 1327 yards to the southeast. 9 Cheetham Street, Rochdale, OL16 1DG — 1569 yards to the northwest. 323-325 Oldham road, Rochdale, OL16 5JG — 200 yards to the south. The Old Post Office, No 2 The Esplanade, Rochdale, OL16 1AE — 1337 yards to the northwest. 319 Oldham Road, Rochdale, OL16 5JG — 194 yards to the south. 106 Yorkshire, Rochdale, OL16 1JY — 1510 yards to the northwest. The Butts, Rochdale, OL16 1XT — 1355 yards to the northwest. The Butts, Rochdale, OL16 1HB — 1386 yards to the northwest. Manchester — 1180 yards to the north. Regency House, Greenacres Road, Rochdale, OL4 1HB — 77 yards to the south. Station Rd, Rochdale, OL11 1 — 566 yards to the northwest. Arien House, John Street, Head office, Rochdale, OL16 2HP — 1503 yards to the north. Unit 2b, Kingsway West Business Park, Rochdale, OL16 5LX — 649 yards to the east. Rochdale — 1523 yards to the north. Rochdale — 1265 yards to the south. Rochdale — 785 yards to the northwest. Rochdale, OL16 1A — 1309 yards to the northwest. Champness Hall Drake street, Rochdale, OL16 1PB — 1117 yards to the northwest. 7 Dodgson Street, Rochdale, OL16 5 — 226 yards to the north. Sandbrook Park, Sandbrook Way, Rochdale, OL11 1RY — 1329 yards to the southwest. Rochdale — 150 yards to the north. Entwistle Road, Rochdale, OL162HZ — 1299 yards to the north. Rochdale, OL16 1 — 1284 yards to the northwest. 15 Drake Street, Rochdale, OL16 1RE — 1263 yards to the northwest. Water Street, Rochdale, OL16 1TL — 1107 yards to the north. Newgate House, Rochdale — 1456 yards to the northwest. Rochdale — 652 yards to the west. south parade, Rochdale, OL16 1XT — 1379 yards to the northwest. Rochdale, OL16 1EY — 1328 yards to the northwest. Balderstone road, Rochdale, OL112AJ — 1320 yards to the south. Rochdale — 482 yards to the east. Sandbrook Park, Sandbrook Way, Rochdale, OL11 1RY — 1406 yards to the southwest. Sandbrook Park, Sandbrook Way, Rochdale, OL11 1RY — 1362 yards to the southwest. Sandbrook Way, Rochdale, OL11 1RY — 1445 yards to the southwest. Crossfit Northern SoulApocalypse training systems, FailsworthRochdale, M359BGOL114EE — 937 yards to the southwest.